Survivor: San Juan del Sur (2014) - 6th place, 13th out - 6th juror. Voted out in Episode 13, "Let's Make a Move" (Day 35). Cumulative time: In-game - 31.5 days; Exile Island - 4 days (2 visits). San Juan del Sur Ep. 1 IC: "Temple of Syrinx" - First through the obstacle crawl, works the puzzle, and Hunahpu wins. San Juan del Sur Ep. 2 IC: "Sumo at Sea" - Wins in his bout against John Rocker, and Hunahpu wins again, 5-4. San Juan del Sur Ep. 3 IC: "Game of Throw-Ins" - Paired with Natalie, scores Josh/Baylor and scores the winning point against Wes/Alec, and Hunahpu wins, 3-2. San Juan del Sur Ep. 4 IC: "The Cruel Sea" - Sits out, as Drew's IC-throwing shenanigans cost Hunahpu the win. San Juan del Sur Ep. 6 IC: "Flips, Flops & Flags" - Retrieves the bags, then blows the puzzle. Coyopa loses. San Juan del Sur Ep. 8 RC: "Long Road to Ruins" - With Alec, Josh, Jaclyn, and Baylor, loses by a lot. San Juan del Sur Ep. 9 RC: "Shake It Off" - Wins both of his bouts vs. Jeremy, but his teams loses, 5-4. Gets reward anyway, thanks to Natalie. San Juan del Sur Ep. 10 RC: "Dirty Water Dog" - With Reed, Alec, and Jaclyn, cruises to an easy reward win. San Juan del Sur Ep. 13 RC: "Austin's E.O.C." - With Keith and Missy, pushes out a last-second win. Swaps himself out of the reward to allow Baylor to join her mom. San Juan del Sur Ep. 7 IC: "Take the Reins" - Tenth to drop out, makes final, 2-ball round (3rd/12). San Juan del Sur Ep. 8 IC: "My Poor Brain" - First out, eliminated on second item in 1st round (11th/11). San Juan del Sur Ep. 9 IC: "The Game Is Afoot" - One of several people working on the third layer (tie-4th/10). San Juan del Sur Ep. 10 IC: "Uncomfortably Numb" - First to drop out, for a plate full of partially eaten candy, a whopping 7 minutes in (9th/9). San Juan del Sur Ep. 11 RC: "Crush" - Takes one hit from Alec, promptly cedes the challenge to Missy, who already had taken two hits, in order to volunteer to go to Exile (tie-5th/8). San Juan del Sur Ep. 11 IC: "Paddle Out" - In a tight race with Keith, just loses (2nd/8). San Juan del Sur Ep. 12 RC: "Ballin' A Jack" - Fifth to drop out, after 20 minutes (3rd/7). San Juan del Sur Ep. 12 IC: "A Bit Tipsy" - In a tight race with Keith, actually wins this time (1st/7). San Juan del Sur Ep. 13 IC: "Vase Off" - Reaches a showdown with Natalie, blown away by the wind (2nd/6). San Juan del Sur Ep. 4 RC: "Tromp Stomp" - Blows an early lead, but beats Jaclyn, 5-4; picks Drew to join her. San Juan del Sur, Ep. 8: First person sent to Exile Island post-merge, follows a spectacularly detailed clue to a poorly hidden idol. Pockets it, tells Jaclyn he has it, doesn't play it. San Juan del Sur, Ep. 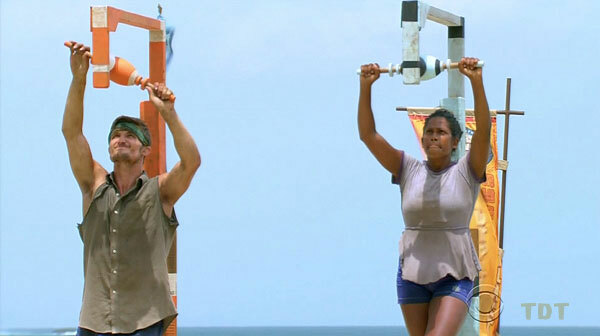 10: After heavy prompting from both Probst and Natalie, plays his idol, saving himself. San Juan del Sur, Ep. 11: Mere hours later, volunteers to return to Exile, where he promptly finds another idol. San Juan del Sur, Ep. 13: Voted out with the second idol still in his pocket. San Juan del Sur, Ep. 13: Two votes, from Natalie and Keith (plus three votes, from Missy, Baylor, and Natalie on the re-vote, after a 2-2-2 initial tie with Jaclyn and Keith; voted out, 2-2-2 [3-0]). San Juan del Sur, Ep. 14: Voted for Jaclyn Schultz (who finished second, 5-2-1). Pre-game posing. Wait... a former NCAA football player? On Survivor? That seems unlikely. Huh. Keith lost. Oh well. Who should I send with Jaclyn? Yep, it sure looks like an idol! We were going to boot Jeremy, but we'll still entertain other offers. Me? Go to Exile? Fine. Maybe we won't boot Jeremy then. Also, he's immune. Oh no! We might not be in the middle next time! We are free to boot Jeremy, then! Time to split the vote against Keith and Wes! Hey! That wasn't very nice. Okay! Time for another idol! Yay, a bed with wine and food. Having an idol and a necklace is pretty sweet! What? ALEC got voted out? Blue team, ready to... win? I'm swapping myself out for Baylor! Is it possible Natalie didn't forget to vote for Keith? Seriously, though. Are we sure Natalie's really with us? 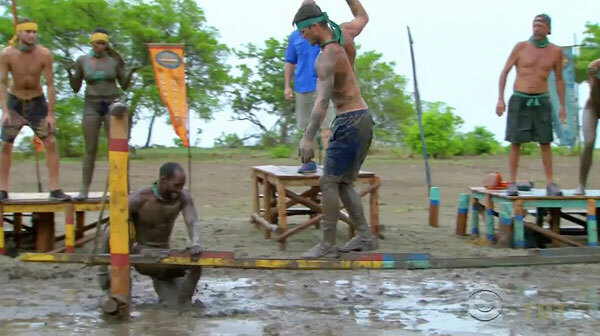 Dalton Ross at EW.com (9/17/14): "Controversial Survivor player John Rocker on what he'll do if recognized"
Gordon Holmes at XfinityTV.com (12/11/14): "Jon - '(Jaclyn Is) a Better Survivor Player Than Me'"
Rob Cesternino at RHAP (12/11/14): "Exit Interview with the Latest Player Voted off San Juan del Sur - 12/11/14"
Josh Wigler at Parade.com (12/11/14): "Jon Misch Engages With His Shocking Survivor Defeat"
What Does It Mean to You to Play Survivor with Your Loved One? Playing with Jaclyn is an incredible opportunity. I've learned in the past that experiencing adversity with others can build the relationship you have together (if you do it correctly). Since there is no experience like that of Survivor, there's no telling the amount that can be gained by triumphing through the challenges that present themselves on a daily basis, let alone those found in treemail!"